Even now without the Horatio-Alger tale of Isaiah Thomas as part of the package, the Boston Celtics seem to have been the NBA’s most enduring storyline of 2017. From an improbable run to the Eastern Conference Finals, notwithstanding a bold off-season roster overhaul, through the grim and gruesome loss of an expected starter and closer, including a fairy-tale 16-game winning skein featuring multiple massive comebacks, and despite a brutally front-loaded schedule that will have included eight of Boston’s 13 back-to-backs before they leave for their international date with the Sixers – a game ironically scheduled to be played at the exact mid-point of the league’s 168 playing dates. While winning nearly 80 percent of their games, the young C’s have generated a vast range of statistical performance. Their FG shooting had been as high as .595 (Denver victory) and as low as .329 (improbable comeback vs. GSW) – and for three-balls, their accuracy has varied from .219 (also vs. GSW) to .615 (last week against the Pacers). That recent game in Indiana was downright bizarre, from the numbers perspective as well as the stunning conclusion. 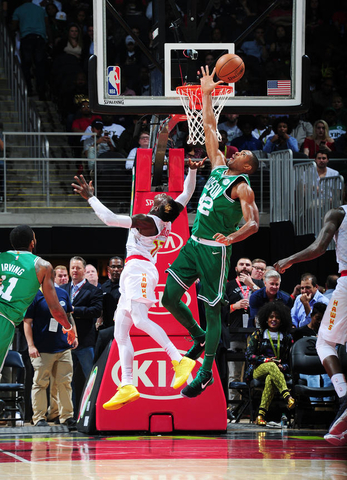 The winning points were scored after a turnover, Boston’s 13th and 14th such tallies for the game. The Pacers, though, compiled 27 points after TO’s and also held an 11-1 advantage on points following offensive rebounds – a combined +23 that Nate McMillan’s troops frittered away. On the season, Boston has scored as many as 26 points off TO’s (again, the Denver win) and as few as two (disappointing loss to Chicago). They’ve allowed as many as 26 (Detroit loss) and as few as six (easy Phoenix win). 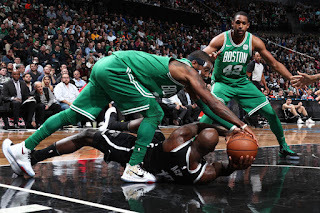 Regarding points after OR’s, the C’s have scored 20+ points three times and allowed that many an equal number of times – even managed to do both while defeating Orlando right after Thanksgiving. Contrarily, the good guys have been limited to five or fewer “follow-up” points on eight occasions while boxing out their foes so efficiently a handful of times. Indeed, this green team has shown the capacity to “do or die” – excel or stink – at a good many components of play. Even in the midst of this wide splay of numerical performance, however, there are a couple of discernible trends – besides the afore-mentioned Road Swag. The (so-to-say) Bad News is that the boys’ performance has been waning in the matter of the back-and-forth “Flow” of play. During their 9-2 start over the season’s first 21 days, the C’s recorded 518 “conversions” compared to the other guys’ 479, a per-game edge of about 3.5 converted possessions. Over the next three weeks – while again going 9-2 – that per-game advantage was more than cut in half to 1.3 (522-508), then disappeared entirely for the third (8-3) three-week segment when the opposition out-converted us 515-510. While it’s true that the team that can “stop” the other guys is going to win most games – 29 of Boston’s first 33 – in today’s NBA it’s becoming increasingly necessary to “master” the three-point stripes. Per-game, the Celtics miss 5.06 FT’s and make 11.48 3FG’s, a gain of 6.42 points (compared to +4.39 for the opposition). 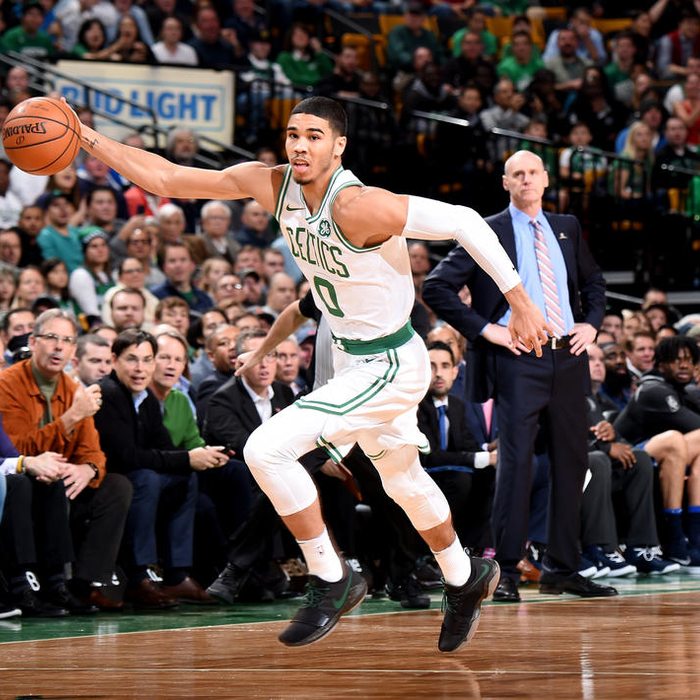 The two-point or so differential in Boston’s favor has them ranked in the league’s top six or seven and has been consistent through each of the season’s three-week segments. And the numbers further confirm the C’s attention to the “three-game” as they rank in the Top Ten in both shooting (.373, No. 10) and defending (.346, No. 3) treys. The 2017-18 Boston Celtics are still a work-in-progress, and the season is destined to deliver a smorgasbord of thrill and frustration. But hey, we could have much bigger problems than Jaylen Brown’s free-throw shooting, right? Happy Holidays to all – and please stay safe!